Dimensions: H50 x W150 x D39 cm. Material: Available in rustic oak and light oak effect with dark metal finish. 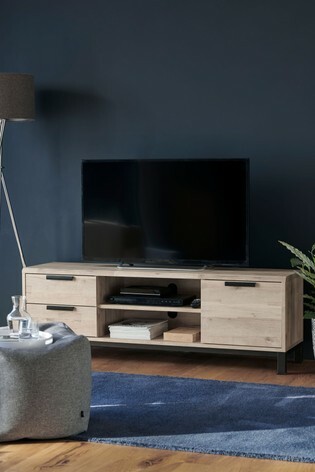 Additional information: Suitable for TV's up to 65"
Rustic light oak effect foil. Dimensions: H38 x W110 x D95 cm. Material: Available in rustic oak and light oak effect with a black metal finish. Dimensions: H172 x W90 x D30 cm. Material: Light rustic oak effect finish. Dimensions: H75 x W101 x D39 cm. Material: Available in rustic oak and light rustic oak effect with metal finish. Dimensions: H55 x W45 x D39 cm. Material: Available in rustic oak and light oak effect. Dimensions: H56 x W28 x D28 cm. Dimensions: H100 x W108 x D39 cm. Additional information: Electric stoves sold separately.